I have been told many times that I couldn’t do my sport. That I would probably be better off doing something else. People backed up their advice with lots of reasons why I should quit. Did I ever let them bring me down? No. Because there was one thing I knew then, that I still know today: I love canoeing. The first time I ever paddled was on the river in my hometown when I was 12. That first day in the current, I tipped. And I tipped. And I tipped. It happened again and again. In reality, I don’t remember much of that first practice. Perhaps I am blocking out the memory. But I can say for sure that falling in the water was what I did. Why, you ask? Because falling in the water was what I constantly did for a full two years following that first practice — I have drunk my fill of river water. My inability to stay in the boat for longer than five minutes came in part from my height. Being a gangly, almost six -foot kid did not help with the balance. But even if I was a shrimp, staying upright in a boat that is only 10 inches wide is no easy feat. Also, canoeing means somehow staying in a lunging position for over an hour at a time, propelling yourself forward with a paddle that is almost as tall as you are. It really isn’t an easy business. Most people learn to stay in their boat within the first few weeks of trying. They fall in the water a handful of times, but usually, by the end of a summer, they are able to stay dry. In my case, I was only getting worse at falling in to the water. Every single practice ended up with me drenched, throwing my paddle in a fit of rage. Every single day my coaches tried to get me into a kayak, rather than a canoe so that I wouldn’t slow down the group. Many well-meaning coaches advised my parents to push me to change sports and stop wasting my time. And all of them could not have been more wrong. Watch Vincent Lapointe dominate her sport. Even though there were lots of legitimate reasons that would have justified my quitting, I was tempted to change neither my mind nor my goal: I LOVED canoe, and I was determined to learn to stay in my boat. During those rough early learning years, there was one major player in my success. That was David Frost, an Olympian who raced in canoe at the 1988 and 1992 Olympic Games. He was the first person to really take the time and effort to accompany me on and off the water, to teach me the basics of our sport. He spent hours by my side on the water, patiently trying to explain how to paddle in a straight line, supporting my pitiful attempts. I remember one particular occasion when we were out paddling together, and I was totally unable to control my canoe direction. I was veering from left to right and back to left again. My boat even slammed into his a few times, but he never said anything negative. He simply explained once again where I was going wrong and what I could do to improve. Without his patience and his positivity, I probably would not have come as far as I have today. I was lucky to find such a strong ally in my quest. You might think that mastering my boat must have been the biggest hurdle I had to face, but you would be mistaken because sadly, it was only the beginning of my fight. As the years passed, I improved in the provincial and national standings, but one thing started becoming very clear to me: many people were against women doing canoe. I don’t understand why they thought that, but I heard people complain that we were either too slow for the sport, or too lazy, or that we simply weren’t made for it. People criticized our technique in the boats, and said we did not have “athlete’s bodies.” These remarks were generally made about women who never had the opportunity to get decent coaching — the self-taught athletes. Even though I was lucky to be part of a club that didn’t shame women’s canoe and who (after a lot of convincing) decided to support me in my passion, it saddened me to know that many of us were treated so unfairly. The injustice even prevented us from racing at the international level. Hard to believe, but prior to 2017 women were not allowed to compete at the Olympic level. It was not until 2010 that we got our first official inclusion in the world championships! I was inspired by some great women. Sheila Kuyper, the Canadian canoeist, and Pam Boteler from the U.S., both fought hard for many years to get our discipline recognized. While they came to be our top advocates in the political fight, I made it my own goal to become the best in the world. 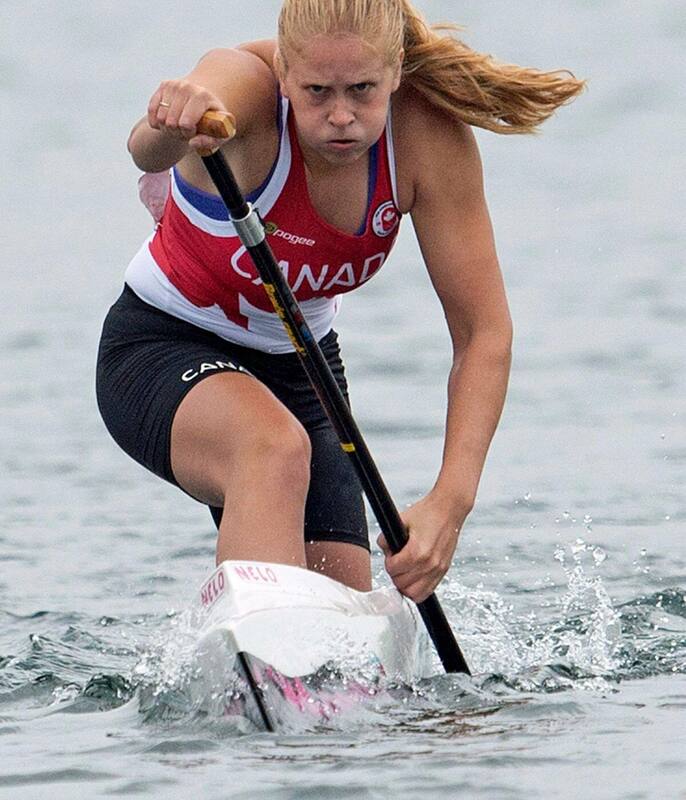 To personally prove to everyone that women were strong and determined to excel at canoeing. I went through ups and downs in the last few years, but I kept going forward. Every time someone came up to me to say that they were amazed that women could paddle so well, I took it as a step in the right direction. Every time a woman told me I had inspired her to start or keep canoeing felt like one more victory for us. Last year, we finally won the right to paddle in the Olympic Games. Our biggest success yet. When I heard I didn’t have to struggle for inclusion anymore, that we would at last be respected for doing what we love, I was overwhelmed with relief and pride. We won our fight. Now, every day I can be myself, and live my passion without fear of being told I am on a dead end. I have learned that nobody can tell me what I should or shouldn’t do, and that the only one who can bring me where I want to go is myself. The Tokyo Olympics will be the first time in my career where I can be part of the biggest competition in the world. I will do everything in my power to make that happen. My decision. It’s going to happen. A: The wheel of time (serie). It really rocked my world as a teen. A: Someone once told me: “Everyone will suffer during a race, but the one who will win is the one ready to accept the pain and push through”. It really stuck with me. A: I kinda wish it was called Mulan. It often feels like I have to prove how strong I can be as a woman. A: To be honest. Honestly. To be fair. Seriously though, I always use them. A: If I could, I would be able to speak every languages on command. A: I am a total geek. When I find something I like, I dive really deep into it. It means I often find myself in weird rabbit holes on the Internet. A: Sheila Kuyper and Pam Boteler (both major players in the equal rights in our sport). Thérèse Casgrain, an activist for the women’s voting right in Québec and the first woman to become a leader of a political party in Canada. Serena Williams, one of the most impressive female athlete in the world and still manages to have a fulfilled life even through her sport. Marie Curie, an incredible scientist and who was the first woman to win a Nobel prize. She ended up winning two Nobel prizes. Florence Night, the first woman who built the basics of modern nursing and the involvement of women in the health care system. All these women were or are big inspirations of mine and make me want to become better in what I do. A: Weird fun fact: I often get teary when I see a commercial about a parent-child relationship. No idea why, it just gets to me. A: If it wasn’t clear enough after all the time I’ve waited for it, I want to become the first woman to win a gold medal in canoeing in the Olympics.